If you love chipotle chiles, this is the gift pack for you. 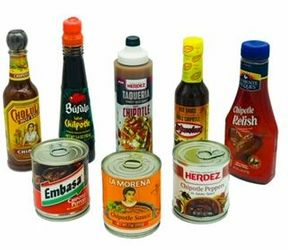 You can try the best brands of chipotles and different types of presentations, such as hot sauces, chipotle peppers in adobo sauce, chipotle sauce, in taco sauce and finishing sauce, as well as cooking sauce. For any recipe you find, you will have the ideal ingredient no matter what the chipotle ingredient is being asked. Perfect for chefs or ammateurs. With this wide range of varieties, you will find which is your favorite way to enjoy chipotle peppers, hot sauce and salsas from Embasa, HERDEZ, La Morena, Cholula, El Yucateco, Zaaschila, Bufalo and Clemente Jacques to enjoy in your favorite authentic mexican meal. Si te gustan los chiles chipotles con este paquete puedes probar las mejores marcas y calidades de productos con chipotle autenticamente Mexicanos en sus variedades de salsas de mesa (hot sauces), chiles enlatados y salsa para cocinar recetas que utilizan sabor a chipotle para los chefs amateurs o profesionales. Con esta variedad de productos vas a descubrir tu chipotle favorito para consumir o enviar de regalo a tus amistades y conocedores de comida mexicana.